What do you get if you cross Twitch with Meerkat or Periscope? This could be huge! And it’s a simple idea: Enable live streaming of what’s on your Android or iOS device along with the view from one of your device’s cameras. That’s it. No PC or anything else is needed to mediate the service, just a direct feed from your device to your legions of fans. What will you be able to stream? Anything; the game of “Lara Croft: Relic Run” you’re playing, the Skype chat you’re having with President Obama, or the First Person View you’re seeing while you’re drone racing along with the view from your camera if you wish. Just three taps and you’re live! Broadcasting to friends, family and anyone else you want to share with. 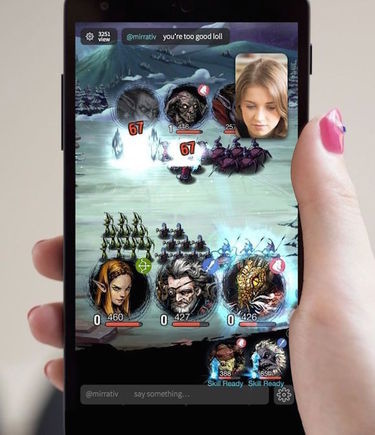 Your “audience” can play a role in creating a unique livestreaming experience, sending you stickers and comments in real-time. With the optional picture-in-picture Face Camera, your viewers can see your reactions at the same time that they are seeing your screen share. This feature can also be turned off. Share certain moments only with friends by choosing a private broadcast which can only be accessed via a unique URL. You can follow your favorite people and get notifications when they start broadcasting. Currently in beta and only for Android (Android 5.0+ required for broadcasting, can be viewed on Android 4.1+). Mirrativ will be available on iOS in the near future.